Clinically proven to improve skin brightness in as early as 2 weeks while helping to diminish visible discoloration in 8 weeks. 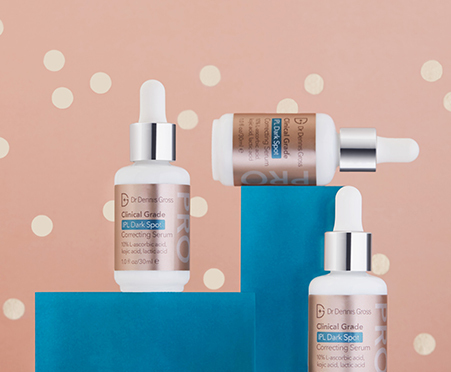 What It Is: Innovative ingredients and technology coming straight from his practice, Dr. Dennis Gross formulated the Clinical Grade IPL Dark Spot Correcting Serum to help fade the look of stubborn dark spots and discoloration for an even and radiant complexion. What’s In It For You: A remarkably even and radiant complexion. 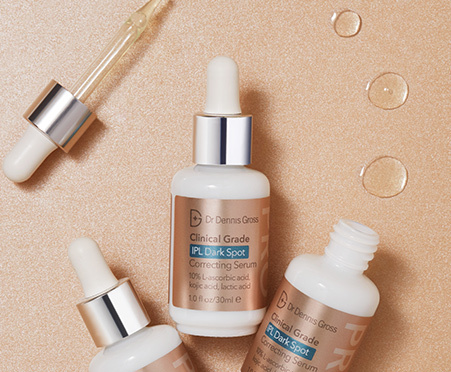 Our formula targets discoloration in 3 ways: removes over-pigmented surface cells, clears and illuminates skin tone, and fights against environmental aggressors. How To Use It: For AM/PM use. Apply as an all-over treatment on clean, dry skin. For best results, use sunscreen daily. Arbutin: Naturally derived from bearberry and known for being a powerhouse skin brightener. Arbutin is a naturally occurring derivative of hydroquinone and believed to be one of the best alternatives to hydroquinone as it provides the skin-lightening effect of hydroquinone without some of the risks. L-ascorbic acid: Naturally derived from fruits & vegetables, ascorbic acid is Vitamin C in its purest form. Potent antioxidants protect and repair skin cells, while increasing the degradation of lipids, resulting in firm skin and reduction of free radicals. Alpha Tocopherol: Naturally derived from vegetable oils, Tocopherol or Undiluted Vitamin E, is a powerhouse antioxidant that reduces free radicals from exposure to UV rays, promotes the healing process, strengthens the skin’s barrier function, protects the skin barrier’s lipid balance, and reduces transepidermal water loss. This formula contains proven concentrations of 10% pure l-ascorbic acid, AHAs, kojic acid, alpha tocopherol, and arbutin – compared to 4% hydroquinone.